Leading from behind in Libya cost the lives of four Americans. That U.S. policy may end up costing many more than the reported 80,000-130,000 lives that have already been lost in Syria. A basic misconception of the Arab/ Islamic world has for decades been ruling U.S. policy regarding the Middle East. Perhaps the most dangerous error in judgment has been the U.S. tacit acceptance of the Assad regimes' decades-long growing WMD arsenal. The salafist terror group, Jabhat al-Nusra, an extension of al Qaeda in Iraq, joined the Syrian Sunni jihadist groups in January 2012. However, it took the State Department almost a year to designate the group as terrorist. Perhaps Obama's repeated assertions that al Qaeda has been decimated as a result of killing bin Laden, slowed the designation. In the meantime, al-Nusra has been attracting Sunni jihadists from all over the world, not only from Iraq. The sophistication and experience of these al-Qaeda terrorists has led to the dramatic escalation in the fighting in Syria and to mortars exploding in the heart of Damascus. As feared, fighting between Sunni jihadis and Alwaites has erupted again in Tripoli, Lebanon's second-largest city, and in Beirut: the Hezbollah-appointed, Sunni prime minister Najib Mikati has resigned, further destabilizing the country. In the meantime, Syrian government forces continued to fire on Hezbollah bases in the Bekaa Valley, and Israeli forces that have been fired on in the Golan, fired in return into Syria. Today, Jordan closed its border with Syria following reports that al Nusra forces had taken over an important junction near the border. Realizing the Assad ship is sinking, the UN decided "temporarily" to abandon Syria. News on CIA involvement in the war has become more detailed, and it's clear that the Agency is helping to airlift in to the Syrian rebels loads of arms from Turkey, Arab countries and from the Balkans. The Arms Pipeline to the Syrian Rebels "More than 160 military cargo flights for Syria's rebels, mostly from Qatar and Saudi Arabia, have landed in Turkey and Jordan since January 2012." In addition, Syrian rebels have been receiving training from the CIA, British, French and Jordanian intelligence services in weapons and counterintelligence tactics to prevent pro-Assad infiltration. And the Pentagon is helping to train Jordanian forces to counter Syria's chemical weapons threat. "U.S. counterterrorism officials said they have seen a growth in communications among operatives from al Nusra Front, al Qaeda in Iraq and al Qaeda's central leadership in Pakistan. Officials also report growing numbers of al Qaeda fighters traveling from Pakistan to Syria to join the fight with al Nusra. The ties to al Qaeda's central operations have become so significant that U.S. counterterrorism officials are debating whether al Nusra should now be considered its own al Qaeda affiliate instead of an offshoot of al Qaeda in Iraq, as it has generally been viewed within the U.S. government, according to a person familiar with the debate." Clearly, rumors of al Qaeda's decline have been greatly exaggerated. Even under heavy fire from Assad, it has grown in strength to become the leading rebel force in Syria. The al Nusra Front is now more of a threat to the U.S. and the West than al Qaeda in the Maghreb and Sahel. The latter has been "fueled" by the disbursement of Qaddafi's Libyan arsenal. 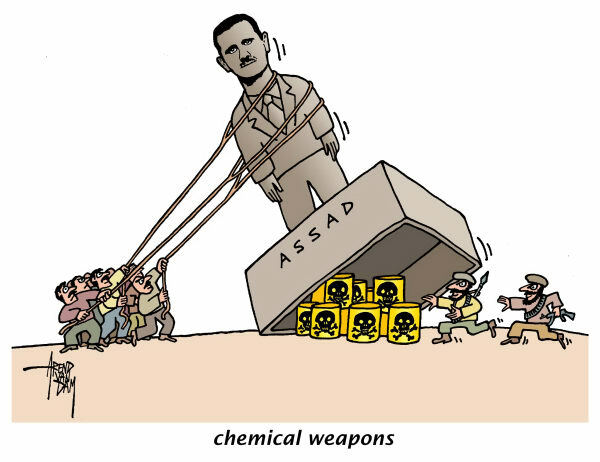 Al Nusra may soon by "fueled" by Assad's chemical weapons. Were chemical weapons on the loose and/or in use in Syria? Immediately after last Tuesday's incident near Aleppo, the Obama administration would neither confirm nor deny this, After all, Obama drew a red line around Syrian chemical weapons, calling their movement or use a "game-changer" for him back in August 2012. A "game-changer" may necessitate a U.S. armed intervention in Syria, which, so far, Obama has been trying to avoid. Reports from apparently informed sources claimed that last December the White House reached out to Assad and allegedly preventing him from launching a chemical weapons attack: "Even as the administration has repeatedly said that Assad has lost 'legitimacy,' because it has expressed its fears of chemical weapons so publicly, it has effectively legitimized him as an interlocutor simply because he has taken his country hostage." The best explanation for Obama's point of view on Syria, apart from his general wish to withdraw the U.S. from the rest of the world in all meaningful ways, is that he doesn't want to anger Iran out of the belief that the U.S. can still reach a diplomatic deal on its nuclear program. "If the Obama White House is capable of sympathizing with Iranian interests, it has failed to take into consideration our own interests in Syria," says Lee Smith. The conflict is spreading and afflicting American allies bordering on Syria-Israel, Turkey, Jordan and Lebanon.... If the administration fears angering the Iranians by backing Assad's enemies, then shouldn't we be angry with Iran for backing Assad to the hilt?" Apparently not. The Obama administration is readying itself and its allies for the next round of "negotiations" with Iran, on April 5-6, in Almaty, Kazakhstan. By then, however, al Nusra and Hezbollah fighters stand a good chance of taking over Assad's chemical weapons, perhaps use them, but surely transport them for use elsewhere. Ely Karmon: Time to put an Alawite state on the map. Obama's visit is an important opportunity for Israel to lobby for a grand agreement between the U.S. and Russia to protect and disarm the Alawite minority in Syria after the fall of Bashar Assad's regime. David Schenker: Saving Jordan's King Abdullah Must Be a U.S. Priority/ Perhaps Washington's best Arab ally, the monarch increasingly lacks money and political stability.